We all have the right to pursue our dreams, make our ambitions a reality, yet very few of us do. There are those who believe that success only favours the chosen few, while others feel it is selfish to but their own dreams between those of others. Whatever your personal take on it, whether you are pursued your own dreams or not, you will know somebody who is teetering on the precipice. If they take that leap of faith they are putting themselves first and if they fail well at least they tried. You also know that if they back away from that edge it is unlikely they will get another shot at it. If you want to help somebody you work with step over that edge, but don't know how to tell them, sending this Pursue Your Dreams ecard will do it for you. A stunning pink skyline is the backdrop for the words “All our dreams can come true if we have the courage to pursue them”. The author of these wise words? 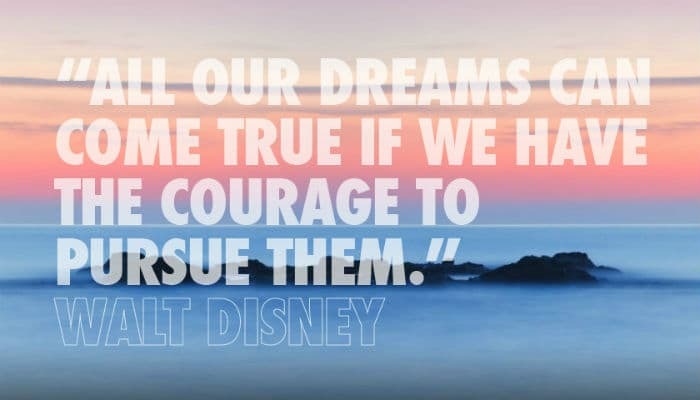 Walt Disney, a man with more experience than most of not only pursuing that dream but making it truly remarkable and life changing. These corporate ecards for business will truly inspire someone to excel at work. If you would like your Christmas marketing to excel then you should take a look at our Christmas ecards for business.